Formerly the ‘Prince Regent’ public house. An early C19 house, with C20 additions at the rear. Originally a shop and post office, it was constructed mid-late C17 and enlarged C19 and C20. A cottage of C17 origins, but restored and extended in the mid C20. The first Village Hall or Institute, was purchased from Whittlesford and brought to the village by horse and wagon in the early 1900’s, where it was erected on the site of the present hall. It was dismantled and re-erected on the recreation ground as the cricket pavilion, and replaced by a Memorial Hall (in memory of the men from the village who had died in WW1) in 1925. The present Memorial Hall was built in 2000, after much fundraising by village residents and grants obtained from various bodies. Formerly the ‘Chequers’ public house. This was the village wheelwright’s shop. These two cottages were the wheelwright’s workshops. The parish church is of C12 origins but much altered in C14 and C15 and again in 1854 and 1878. Many of the church fittings are associated with the De Freville family and several interesting brasses survive. There are also numerous monuments and inscriptions to commemorate the lives and service of members of the Wale family. Thomas Blossom, one of the founding fathers of the United States, is likely to have been christened at the church. The cross is medieval with some C20 restoration. Formerly the Rectory, it was built in 1858 for the Rev. James Edmund Law in the early English Gothic revival style. 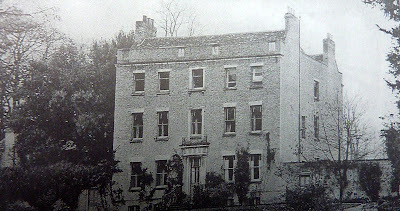 In 1962 the Rectory was sold into private ownership and a modern house for the Rector was built further along Manor Road. The house was built in the early C18, with facade of c.1746. The Georgian Manor House stands in a secluded position in Manor Lane. From the late C13 it was the main seat of the De Freville family, but after 300 years they sold it to Tobias Palavicino , a son of an Italian or Genoese by birth, who had commanded one of the English men-of-war in The battle with the Spanish Armada in 1588. This house was largely Demolished in c.1750 and the present house, designed by Inigo Jones, was built. This was built in the early C18. The summer house is situated in a corner of the walled garden at the side of the River Cam/Granta. The coach house, now a garage with an apple loft above is dated 1708. The bridges over the River Cam/Granta are a natural boundary division between Great and Little Shelford. Fanny Wale recalls that a line was marked on the wall between the two bridges and here the two villages’ boys met to fight on their own village boundary. The Camping Close which is owned by the Wale family, was usually rented out to a local farmer. Up to 1845 members of the Wale family were buried in a mausoleum which stood in the corner of Camping Close nearest to the church. However, with the prevalence of bodysnatching in those days, which meant graves needed to be guarded for two months after a funeral, it was decided to move the coffins into a vault in the church. In Fanny Wale’s book there is an account of military manoeuvres and of troops camping here during WW1. The cottage built in the early C18, takes its name from nearby milestone. The milestone is mid C19, is cast iron and triangular in shape. Known as Ivy Cottage until very recently, it was constructed in the early C18 and enlarged in the early and late C19 and late C20. In 1900 Fanny Lucretia Wale lived in the cottage. She was the last member of the family bearing the name of Wale to live in Little Shelford and she left a wonderful legacy in the form of a book called ‘A Record of Shelford Parva’. She compiled the book between 1907 and 1927 and it provides an excellent record of life in the Shelfords at the beginning of the C20. The recreation ground was given to the village by the Wale family in 1952. It is the home of Little Shelford Cricket Club who has played here since 1877. The Rev. David Shepherd, who played cricket for England before entering the church, played for Ridley Hall v. Little Shelford in the 1950’s. Little Shelford Bowls Club, which previously played bowls on the lawn of Priesthouse, moved to the recreation ground in 1946. Riverside Walk is a footpath created in 2005 by the Little Shelford Wildlife Group. Within the walk there is an ancient ice pond, once part of the parkland of Shelford Hall. The walk takes you along the side of the River Cam/Granta. This small estate was built after the compulsory purchase of the land, which was owned by the Wale family, for £500 immediately after WW2. This was Walker’s general stores and post office from 1964 until 1991. Since then it has been the offices of several different companies. A private housing estate built in the late1950’s and early 1960’s. surviving outlying remnant of a once much more extensive feature – perhaps when in flood as much as a kilometre across. This natural basin would be flooded today, but for the fact that at some period in the past (perhaps in late medieval times) a ditch was dug along the common Parish boundary with Newton to allow the impounded water an outlet into the River Cam well downstream and to the north of the village. The ditch can be seen in Newton Road and Hauxton Road. The pond which lies to the south of and just outside the village was ‘inter-communal’ with Whittlesford until the Enclosures Award of 1814 and is now embraced within the parish of Little Shelford. 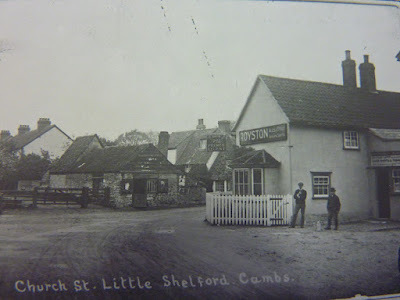 Residents of Little Shelford were also given the rights of access to, and use of the pond, as well as the village ‘clay pit’. The pit provided ‘clunch’ for buildings within the village, which were then mainly of claybat or lathe and plaster construction. A similar grant of a ‘gravel pit’, (now Moor Close) was made at the same time. An ex-resident born in Little Shelford remembers the pond occasionally freezing over in winter and the ice being thick enough to skate on it. To provide access to the clay pits, a 32 foot (9.75 m) wide ‘private bridle and carriageway’ was created. In the 1990’s Bradmere Lane was very much overgrown and it was cleared and opened up by a group of young offenders performing community service. A farmhouse built c.18. This was the home of Francis Bacon, designer of the fuel cell that was used by the USA in their Apollo moon missions spacecraft. He later moved to 34 High Street. A cottage probably constructed in the late C17 with C19 additions to the east and north. The oldest house in the village was built in C15 with additions and alterations in C17 and later. The barn is early C16. The pump was built in C19 and is cast iron. It is still in good working order, but is only to be used in times of emergency. As the sign on it says ‘Do not drink’. The terrace is a footpath that links the High Street with Whittlesford Road. It became ‘The Terrace’ from the terrace of thatched cottages that bordered this footpath at the High Street end and the pan tiled cottages towards Whittlesford Road. A cottage built in the late C17. A late C17 cottage and extended in the early C18 and again in the C19. It was restored c.1983. This was originally a row of cottages, probably of late C17 construction with C19 alterations and a C20 addition at the side. 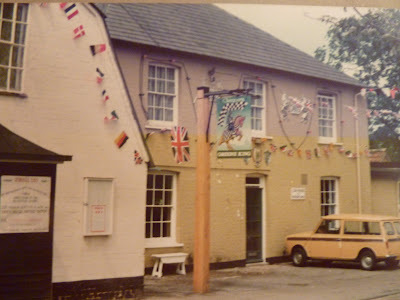 It was originally called ‘The Plough’ but in the 1980’s because of mistaken identity with the ‘Plough’ public house in Great Shelford the name was changed to ‘The Navigator’. This was the home of the Wale family before they had the ‘White’ house built opposite the church. Site of the home of Professor James Meade, joint winner with the Swedish economist Bertil Ohlin, of the Nobel Prize for Economic Sciences in 1977. This row of cottages was built around 1870 when there was a demand for more labourers’ homes to accommodate the growing population. The house is late C19, but incorporating a C16 cottage. Air Commodore James Coward lived here while he was stationed at Duxford during the ‘Battle of Britain’. He was shot down over Little Shelford and lost a leg. The dovecote, now a garage, was built in the C18. The cottage is mid C17in construction. In the 1960’s and 1970’s, this was a finishing school for girls. Arthur Dunn, who captained the English football team four times, and also played in two FA Cup finals, lived here. Formerly Butler’s bakery and shop with living quarters behind the shop. The building has been renovated and is now a private house. The chapel behind No 15 was founded in 1823 and rebuilt in 1881. The chapel closed and was sold to become a private home. The cottage is late C17 with a slightly later bay added to the road end. Purchased by the parish council and now the village library. was derived from the view of Margaret’s or Maggot’s Mount from this part of the village. The allotments were named after Blennie Powell (a member of the Wale family) who originally owned the land and sold it to the village. A cottage of several building periods, but mostly late C17, with C19 alterations and C20 enlargements. It was the village blacksmith’s smithy. The house name was taken from a once thriving rope industry that was carried out on this site that ran parallel with Church Street . The home of Sergeant Sid Dockerill, who was awarded the Military Cross during WW1, when the Cambridgeshire Regiment were involved in storming the Schwaben Redoubt in the Battle of the Somme in 1916. His medal is on display in the Duxford Imperial War Museum. Formerly the ‘Red House’ – a children’s home until the late 1980’s. ‘He lived an advocate for liberty, a good subject, an agreeable companion, a faithful friend, an hospitable neighbour and in all parts of life a useful member of society.’ This is part of the engraving to be found on the obelisk which is situated on St Margaret’s Mount, or Maggot’s Mount, a high vantage point to the west of the village that can be reached by a footpath from Newton Road. It was erected in 1739 to the memory of Mr Gregory Wale by his friend James Church. They regularly met at this place on horseback over many years and agreed that whoever should live the longest, would erect a memorial to their friendship on this high ground overlooking the parish. It was Mr Church who lived to carry out this pact. The obelisk is actually in the parish of Harston. This was the site of the West End Brewery. The brewery was not very successful, perhaps it could not compete with the larger brewers and by 1916 the premises were no longer used for this purpose. The buildings were demolished by 1966. Once the level crossing gate keeper’s house, but now a private home. This is the main line between Cambridge and King’s Cross. The body of King George VI was brought along this line from Sandringham in Norfolk, where he died, to London in February 1952. The flood relief ditch passes under both these roads before making its way to the River Cam/Granta. This section of the M11, from the Stansted junction to where the road joins the A14, was the third and final part of the motorway to be built and was completed in the 1970’s. Heritage trail words written by Ray Saich, Chairman of the Little Shelford Local History Society.